Astronomy club ventured to Penn State last week to tour the NASA Swift mission headquarters! 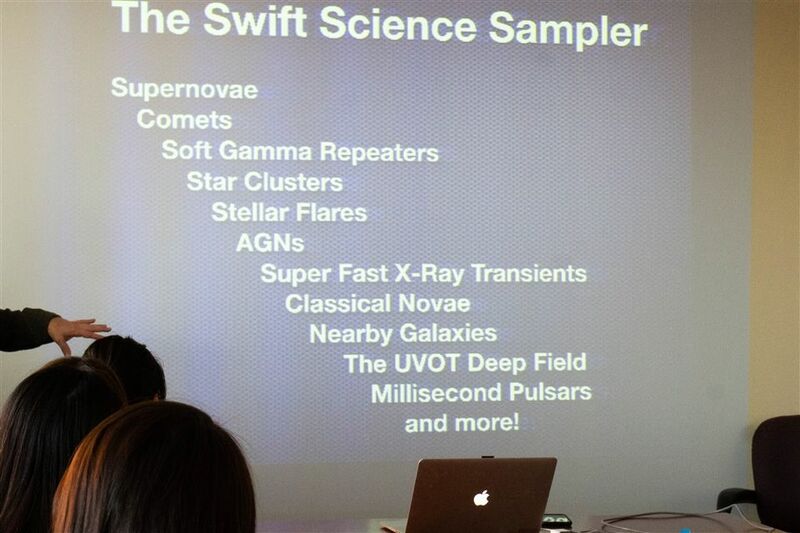 Swift's original purpose was to search the universe for gamma-ray bursts (GRBs). Since then, the Swift mission has branched out to study all sorts of space phenomena and has greatly increased our understanding of the early universe, where heavy elements came from, when stars began to form, and much more. Swift is one of NASA's older missions with its launch stretching back to 2004. Its original goal was to search the universe for gamma ray bursts (GRBs). GRBs occur as very massive stars go supernova and collapse down to form black holes. They can also form when two less massive neutron stars collide. Since then, the Swift mission has branched out to study all sorts of space phenomena and has greatly increased our understanding of the early universe, where heavy elements came from, when stars began to form, and much more. It was instrumental in the gravitation waves discovery in August of 2017 too (one of the most exciting discoveries of our time). 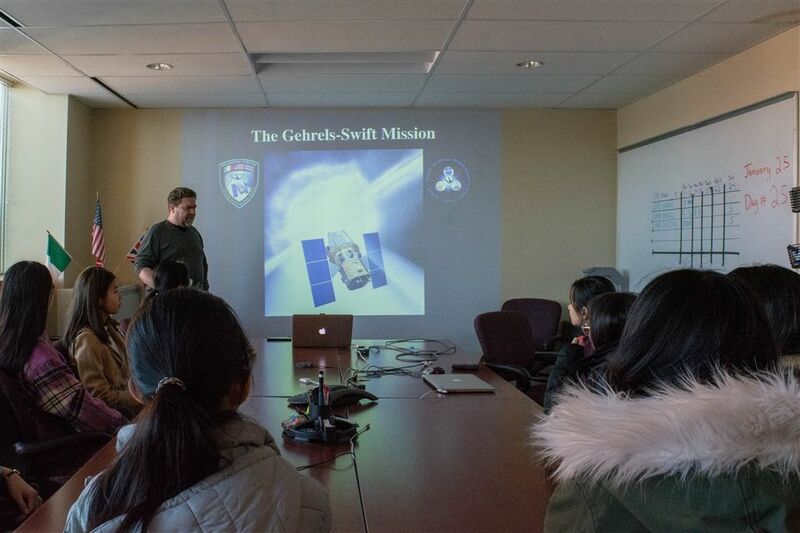 "This 14 year mission is still doing new science," director Michael Siegel told the girls. One of them asked, "How can you know all of this stuff from just a tiny picture?" 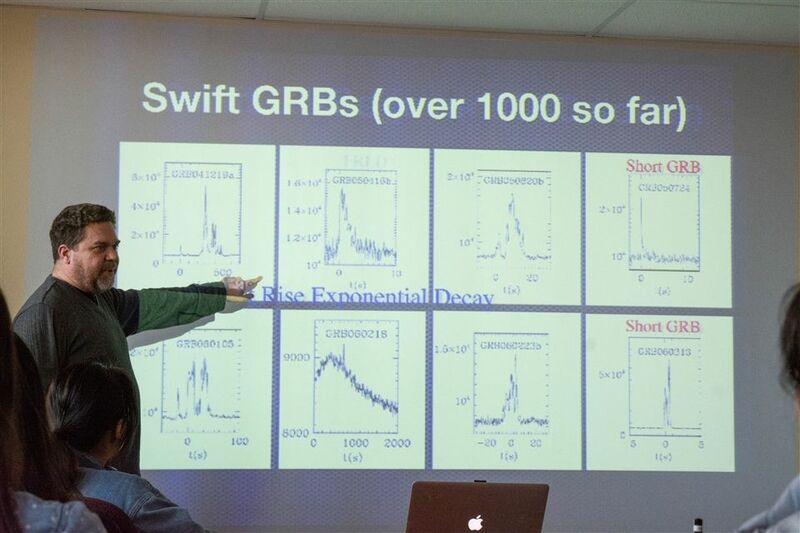 He explained that Swift is not just an optical telescope. It also sees objects in x-ray and in ultraviolet and they tell us much more. X-ray gives us information about high energy happenings and ultraviolet images can tell us what chemical reactions are occurring. GRBs in particular are very bright and with that much light coming in, we can look at spectras and learn about the chemical fingerprints of what we are looking at. The girls were really excited to be in the mission control room as a data transfer came in. The 8 minute window downloaded health and safely information from the satellite as well as information from the targets it took images of (including a GRB that they have been following for the past few days). Astronomy club ventured to Penn State last week to tour the NASA Swift mission headquarters!